People who know me well know that I DON’T cook. It’s not just that I’m incapable of slicing an onion without cutting my fingers, it’s that my interest in the kitchen domain revolves around the microwave and Haagen Daz in multiple flavours. They’re $28.75 from Boojiboo on Etsy, and I think the sweetheart neckline would look amazingly flattering. 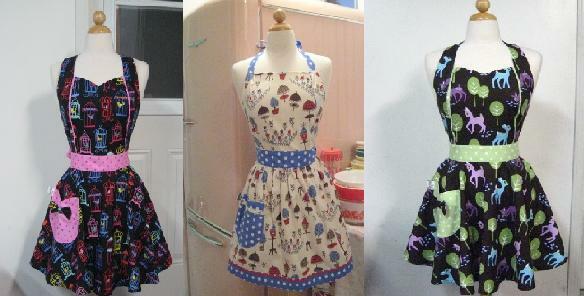 I am just wondering where you got the pattern for your aprons? i sew as a hobbie and wanted to make some to go in the gift bags at my sisters baby shower. Hi Kandice, the pattern is not mine, try contacting the Etsy seller. Cheers.